In this September 20, 2015, file photo, the United States scores a goal against Haiti during the US Women's 2015 World Cup victory tour match at Legion Field in Birmingham, Alabama. Sportswear maker Adidas says it will give the same bonus to any of its sponsored players on the Women's World Cup-winning soccer team as their male counterparts. On Friday — International Women's Day — American players filed a federal discrimination lawsuit against the U.S. Soccer Federation over equal treatment and pay. The players alleged ongoing "institutionalized gender discrimination" that includes unequal pay with their counterparts on the men's national team. 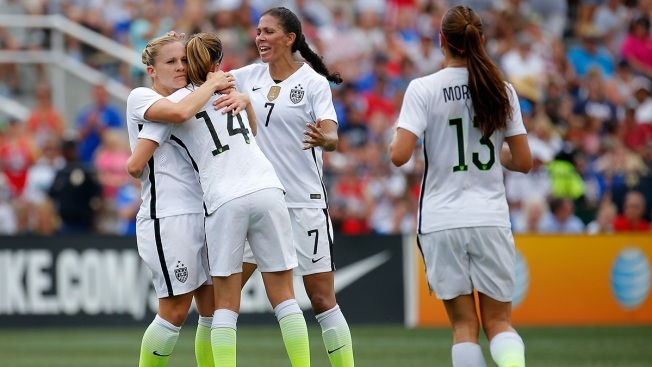 The U.S. defends its title at the Women's World Cup, which starts June 7 in France.